Researcher S. James Remington and colleagues at the University of Oregon in Eugene and at the University of Alberta in Edmonton, Canada, have discovered why a fluorescent protein can recover its fluorescence after photobleaching, a process also known as photoswitching. Remington said that the mechanism likely applies to all photoswitchable proteins, including GFP. 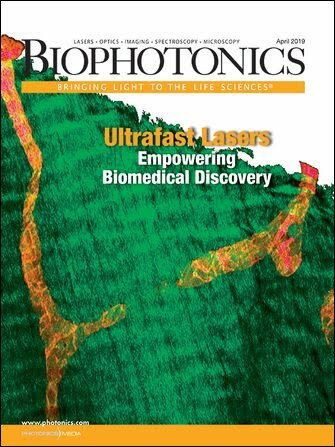 Recent advances in fluorescence microscopy use photoswitchable fluorescent proteins to enable visualization of biological structures that are 1/20 the size of what the wavelength of light would theoretically allow, he said. For their experiment, the researchers used a brightly fluorescent protein that they created about a year ago by mutating a protein homologous to GFP that is found in the tentacles of sea anemones. Although excitation with a blue laser (458 nm) caused rapid photobleaching, the protein spontaneously became fluorescent again within minutes. UV light (~365 to 400 nm) made the molecule return to the fluorescent state much faster. Researchers have discovered why a fluorescent protein can recover its fluorescence after photobleaching. They believe that the mechanism will apply to all fluorescent proteins that can photobleach reversibly, including GFP. The chromophore, shown as a model with atoms filled and as a stick model, rotates dramatically as it switches between fluorescent and dark states. The investigators used x-ray crystallography to examine the proteins in the fluorescent and photobleached states. For the x-ray sources, they went to the Advanced Light Source in Berkeley, Calif., and to the Advanced Photon Source in Argonne, Ill. Although most crystallographers have x-ray sources in their own laboratories, Remington said that these light sources are approximately 1000 times more intense. The crystal structure of the molecule in the fluorescent state revealed that four side chains of amino acids and a water molecule align in the same plane with the ring-shaped group of atoms that constitutes the chromophore. One of the side chains, a ring-containing histidine, noticeably stacks upon the chromophore. During the transformation to the dark state, the chromophore and all the side chains move significantly, ultimately adopting an unstable conformation in different planes. In fact, the chromophore ring turns ~180°, and the histidine ring flips by approximately 90°, away from the chromophore. Remington said that the hydroxyl group of the chromophore must be ionized for efficient fluorescence. The attraction of the ionized chromophore to the side chains returns the molecule to the fluorescent state. UV light hastens the return to this state because it promotes ionization of the chromophore. In the dark state, the hydroxyl group of the chromophore and a methyl group of an isoleucine side chain weakly repel each other. The researchers hypothesized that this interaction is a key to the photoswitching mechanism. Therefore, they made a second mutation, in which they substituted the isoleucine with threonine, which is smaller and thus does not crowd the hydroxyl group as much. Threonine also can make a favorable interaction with the chromophore. The mutation caused the protein to remain in the dark state for 65 hours, instead of five minutes. “The result was a spectacular confirmation of our hypothesis,” Remington said. The researchers want to use the information gained from this study to transform normal fluorescent proteins into photoswitchable ones and to create a fluorescent protein that remains dark until photoactivated. 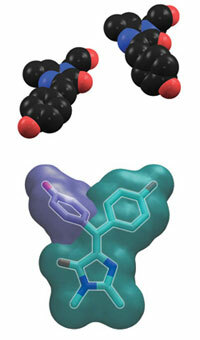 PNAS, April 17, 2007, pp. 6672-6677.